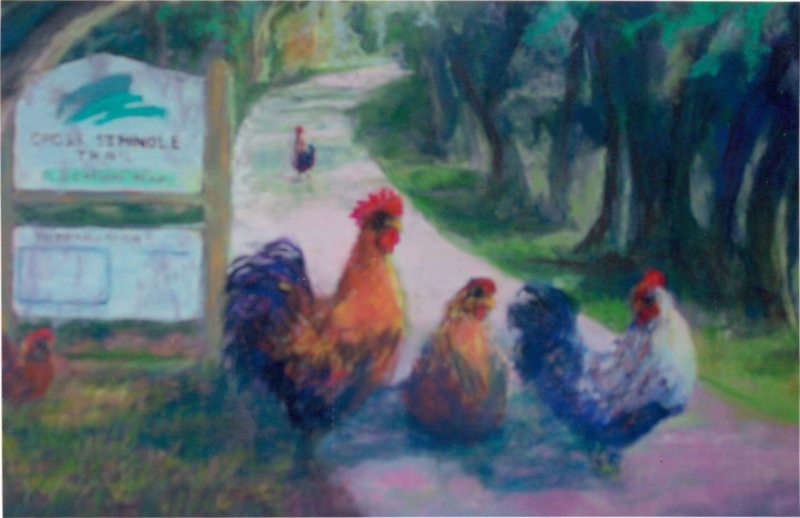 A painting by Bettye Reagan, a local artist in Central Florida, featuring chickens at the Cross Seminole Trail. The trail was created from the former railroad line of the Sanford & Indian River Railroad, running between Sanford and Oviedo. In the early 1900s, a spur was added to the line, running north and east in order to allow farmers of Black Hammock a way to ship their produce to Sanford and Winter Park. The spur was later abandoned due to the advent of automobiles and the decline of the agricultural industry in Black Hammock. The tracks remained until they were purchased by the State of Florida for the Cross Seminole Trail. Original painting: Reagan, Bettye. Oviedo Chickens. 1996: Private Collection of Bettye Reagan. Digital reproduction of original painting: Reagan, Bettye. Oviedo Chickens. 1996. "CROSS SEMINOLE TRAIL." Seminole County. http://www.seminolecountyfl.gov/departments-services/leisure-services/greenways-natural-lands/trails/cross-seminole-trail.stml. "Cross Seminole Trail Overview." RailsToTrails.us. http://railstotrails.us/fl-cross-seminole-trail.html. Reagan, Bettye Jean Aulin. 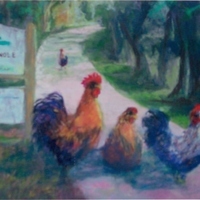 “Oviedo Chickens by Bettye Reagan.” RICHES of Central Florida accessed April 22, 2019, https://richesmi.cah.ucf.edu/omeka/items/show/6969.